It's low-cost and based on Raspberry Pi and Arduino. Antdroid offers the best with less. 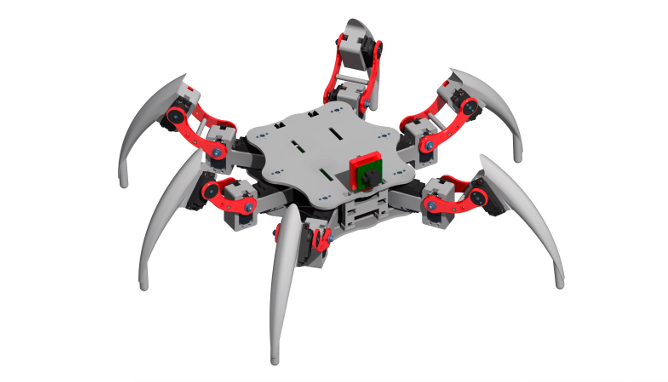 Antdroid is a fully open source hexapod robot with educational proposes based in ROS. Its totally parametric design allows you to assemble any hardware you like. It's designed to be easy to reply. The frame is fully 3D printed. The software is divided in two parts: the firmware and servo control is done by an Arduino Mega and the top level control is done by Raspberry Pi running ROS. Antdroid limits are only in your imagination. You can download Antdroid for free, the code is licensed under the GNU GPL v3. You can also get the source code directly from GitHub if you prefer.